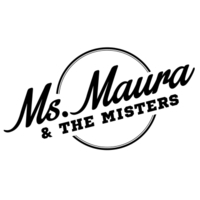 The Matey’s Log: Sailing Season Begins | Paul's Voyage of Discovery & Etc. Captain George Moll wanted his crew on the H dock in Ventura Harbor at 8:00 am on Saturday morning, February 13. It was a good thing that the race was being run the day before Valentine’s Day. 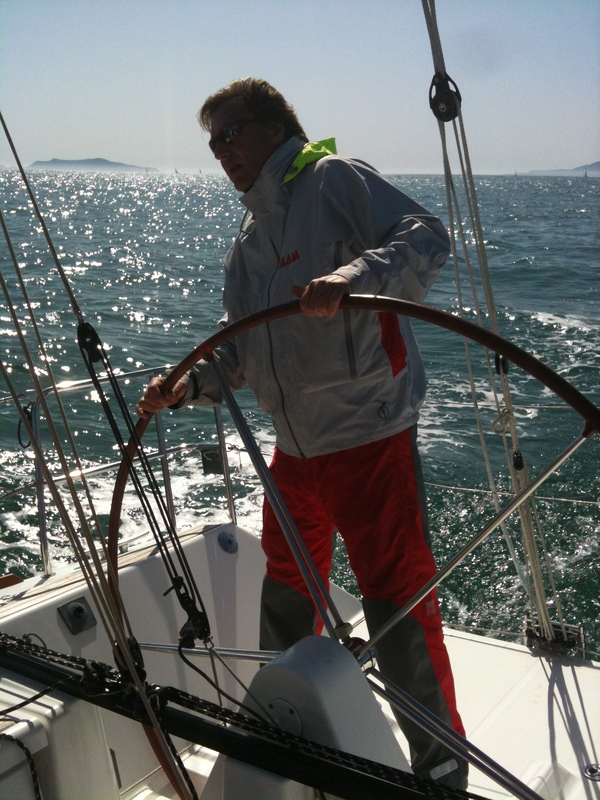 Like golfing, sailing is a sport that takes men out of the house for long stretches of time on the weekend. 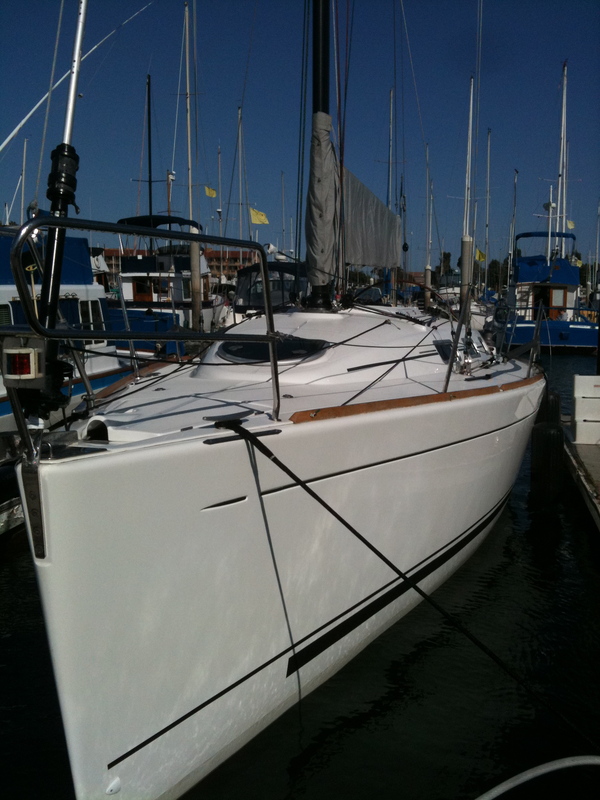 But sailboat racing is worse than golf because it’s never certain when you’ll be done. 18 holes of golf always take about the same amount of time to complete. 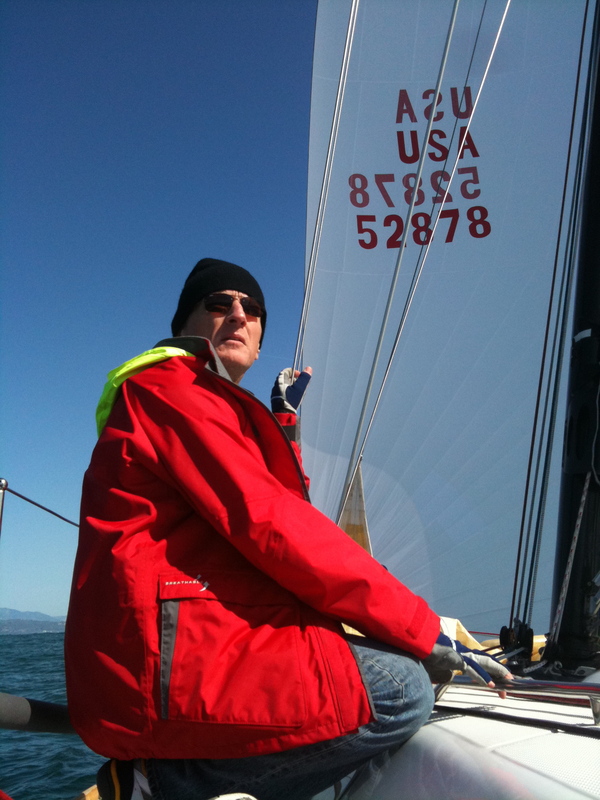 The duration of a sailboat race depends upon the vagaries of the wind and conditions on the water. The race was set to start at 11:00 am, and if the gods Aeolus and Poseidon were with us, we could easily be back on the dock by 4:00, as I’d promised my wife, Victoria. Or we could be home much, much later. Captain George wanted us at the dock good and early because our boat, a 32-foot Beneteau First 10R named Sprit Decision hadn’t been in a race since early December. The crew was glad to be racing again. We were all veterans of earlier campaigns, though every one of my crewmates is a far more experienced sailorman than I am. Captain George and Captain Tom Weber own Sprit Decision. George and Tom are a pair of old salts who keep everyone entertained with their crusty maritime Oscar and Felix act. 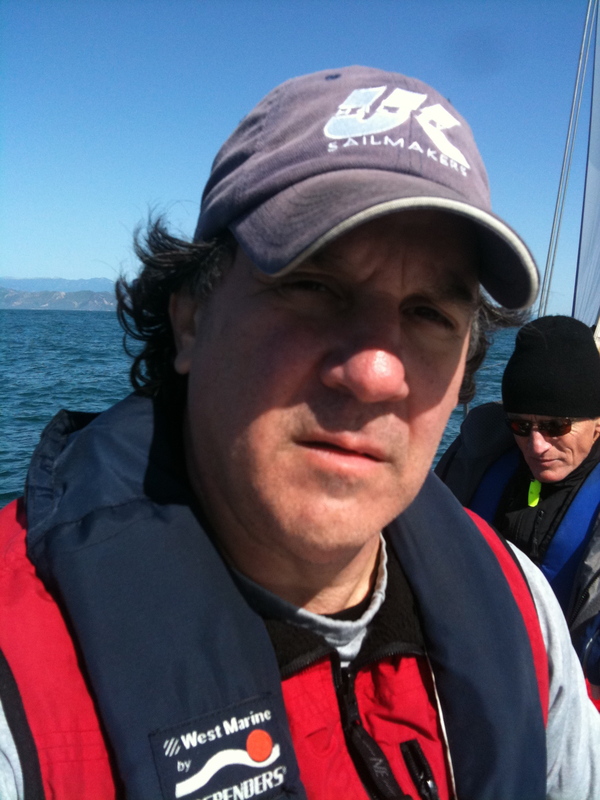 Affable, gentlemanly Michael Froelich skippers his own boat, and is a key member of our crew as a helmsman and sail trimmer. 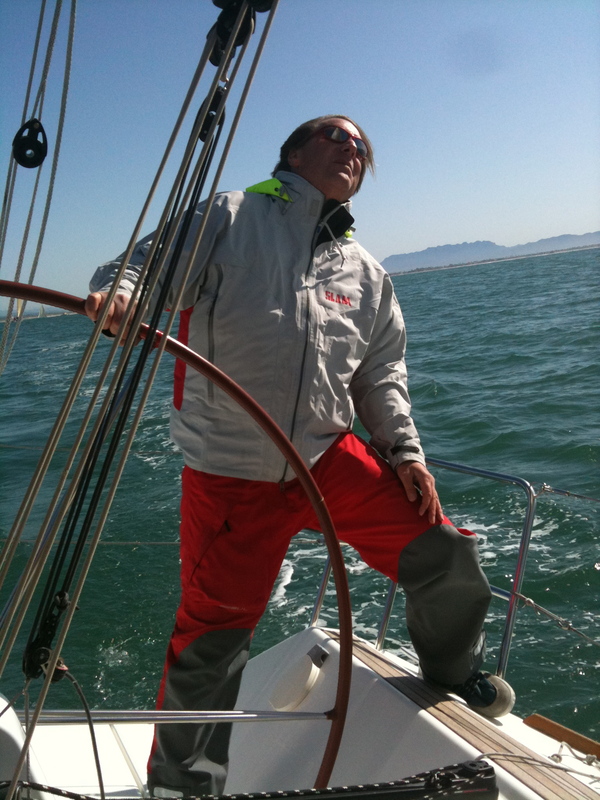 Claude Dubreuil, an expert diver and sailor, is our fearless leader on the foredeck. (I assist Claude on the foc’s’le.) 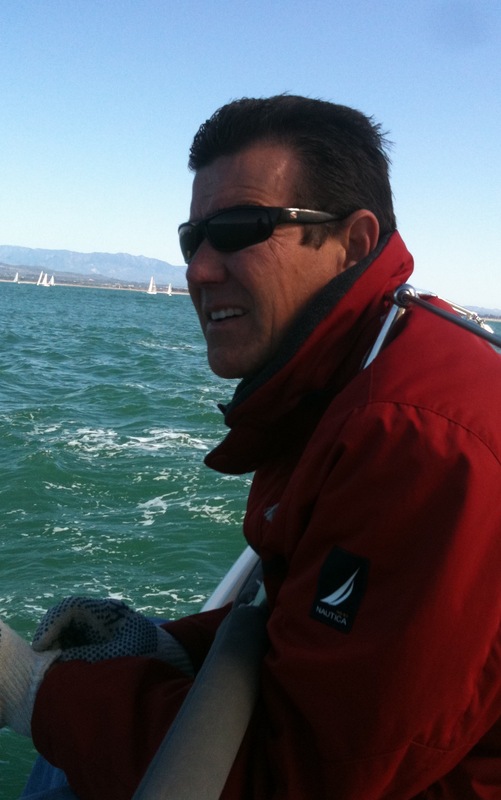 And my longtime buddy, Darroch Greer, may be the new guy on the foredeck crew, but as a diver, sailor and surfer, he’s also much saltier than me. And me? Well, they call me “The Matey”, but my virtues as a sailor extend little beyond blind loyalty to my captain, the strength to haul lines and pump halyards, a knack for cursing like a tar in Nelson’s navy — and a good bit of weight on the rail. All in all, the six of us were a fine crew with which to start the 2010 racing season. The February 13th race was the first of the Spring Series sponsored by the Pierpont Bay Yacht Club out of Ventura Harbor. Sprit Decision was among the twenty or so boats competing in the spinnaker class. 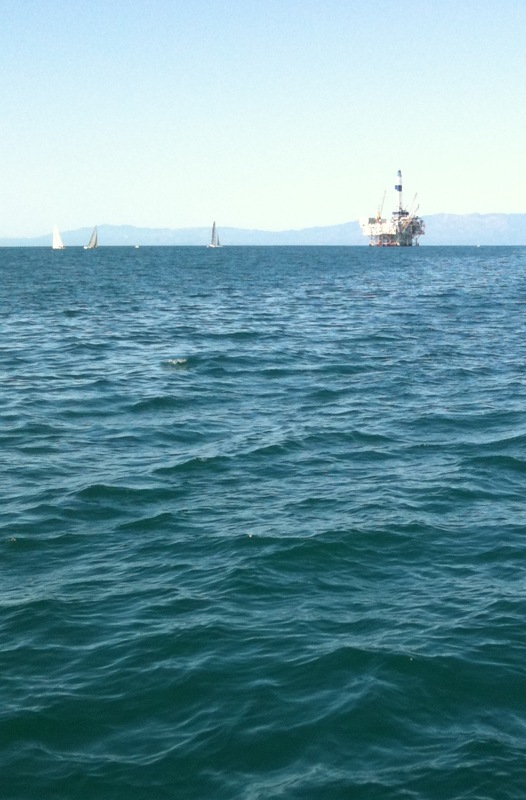 The racecourse began at the Mandalay buoy, across the Santa Barbara Channel, around oil platform Gilda, then back into Ventura Harbor. 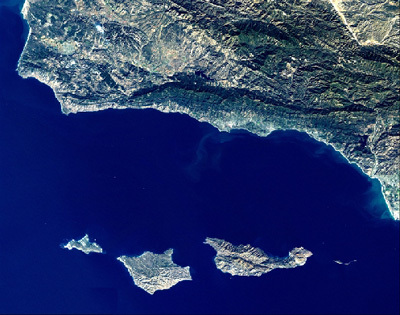 The Santa Barbara Channel is a glorious stretch of blue Pacific Ocean that separates mainland California from the northernmost Channel Islands. It runs between Point Conception and Oxnard on the coast and the islands of Anacapa and San Miguel. It’s as gorgeous a body of water as you’ll find on the planet, and whether you win or lose the race, it’s a pleasure to spend time on these waters. As we sailed out of Ventura Harbor, we saw hard-working souls in two large out-rigger canoes paddling their way back inside the breakwater. It was a reminder that human beings have been navigating the Santa Barbara Channel for centuries – maybe even millennia. For many centuries before they first encountered Europeans in 1542, when Juan Cabrillo and his cohorts arrived from Mexico to “discover” the channel, the Native American Chumash tribe went back and forth across the channel in large, primitive dugout canoes, connecting the islands with their mainland villages and establishing trade between them. 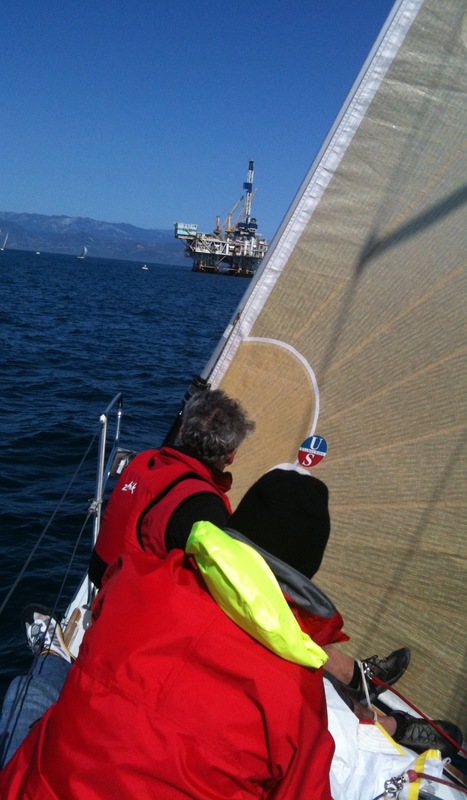 We crossed the starting line just a few seconds after 11:00 am, and were sailing among the leaders, headed for the offshore oil platform called “Gail”. (All the oil platforms in the channel are named after women. It does get lonely on those platforms.) Platform Gail is about 10 miles from Ventura Harbor – and with a steady 10-15 knots of wind, we were showing 7-8 knots of boat speed. At that rate, we’d round Gail within a couple hours. Sprit Decision, her bottom newly-cleaned and treated, was knifing through the large, wide, rolling swells, as we made our way toward Gail. Gail and her sister platforms are sitting in the Santa Barbara Channel because of the many oil fields below its sea floor. The channel has been mined for over 100 years – and was the site of the very first offshore oil well in 1896. The channel was also fouled by one of the worst oil spills in history in 1969, when the black stuff came oozing out of fissures around a recently drilled offshore well a few miles south of Santa Barbara, blackening hundreds of square miles of water, killing aquatic wildlife, and mucking up the beaches from Goleta to Ventura. That disaster helped to galvanize the nascent environmental movement in the United States. I must admit, I wasn’t thinking much about that history as we rounded platform Gail because there would soon be important work to do. 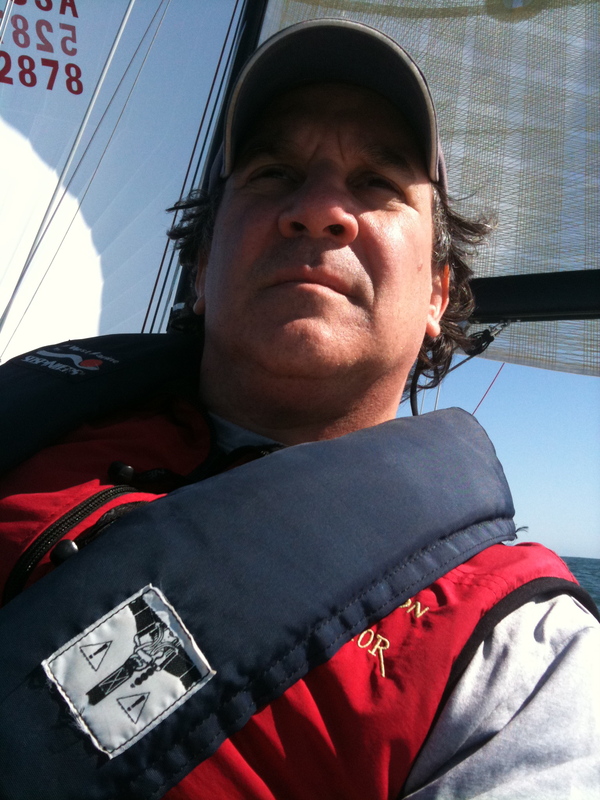 Once we got around Gail and were headed back to Ventura Harbor, the wind would generally be on our stern – which meant a spinnaker run to the finish line. Flying the spinnaker is one of the main responsibilities of the foredeck crew, and it’s one of those critical shipboard evolutions that can either kick the boat into a higher gear – or trigger a disaster. Before the race, we’d practiced deploying the spinnaker – with mixed results. 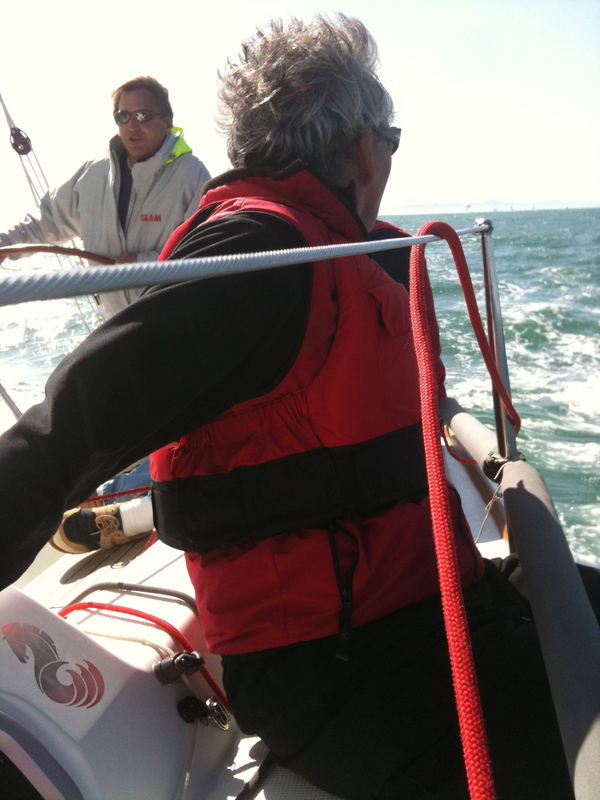 (Among other snafus, I managed to nearly get myself knocked off the boat helping to jibe the spinnaker.) But, rounding Gail, we got our spinnaker flying with very little drama, and were soon making between 10 and 11 knots on our run back to Ventura Harbor. Claude looks back to admire the swell. Since the start of the race, the long, rolling swells pushing toward the shore had continued to build – and were now quite large: eight to ten feet from crest to trough. As it was a following sea, Sprit Decision was literally surfing the swells that came in under her stern. The sea, the ship, and the crew were in a great rhythm less than a mile to the finish – but it wouldn’t last. Suddenly, as we neared the shore and shallower water, the perverse geometry of the sea came into play, and the swell began to fall off more precipitously. 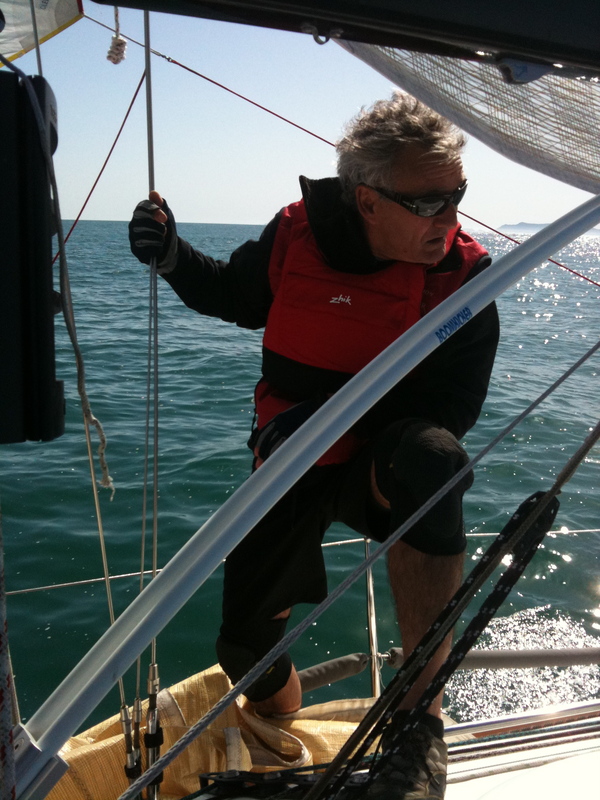 The wind was gusting as we were riding down one particularly large swell, and as Sprit Decision’s bow dipped dramatically – a gust of wind drove the spinnaker down toward the trough of the swell. The boat’s bow was pushed parallel to the rolling swell and the boat was listing heavily to starboard, its rail nearly in the water. In an instant, we were on the verge of getting knocked down and broached by the onrushing swell. Michael, trimming the spinnaker, came close to a bath when we were nearly knocked down. Quick work by all hands kept the ship from heeling over disastrously, but it was critical to de-power the spinnaker. (In other words, get the wind out of it, so it wouldn’t be driven into the water, taking us with it.) Alas, one of the spinnaker’s working sheets got hung up on deck cleat! You may not know what all that means – but the bottom line is that we were nearly knocked down a second time before we were able to free that spinnaker line, right the ship, and haul down the spinnaker. Of course, there are no photos of these wild and wooly moments. At times like that, it’s all hands on deck! Twenty minutes later, we were across the finish line. It had been an exciting and satisfying first race of the season. I’m not sure where we finished – probably somewhere in the middle of the fleet – but it was a pure joy to survive the experience with Captains Moll and Weber and the gallant men of Sprit Decision. And, best of all, with the wind as consistently stiff as it was – we finished at 2:00 pm. That’s two hours earlier than I told Victoria I’d be done! So, I got home earlier than expected. A good start to the new sailing season, indeed. What follows is a photo album from the race. All photos were taken on my iPhone — which, luckily, avoided going in the drink. Captain George at the helm. 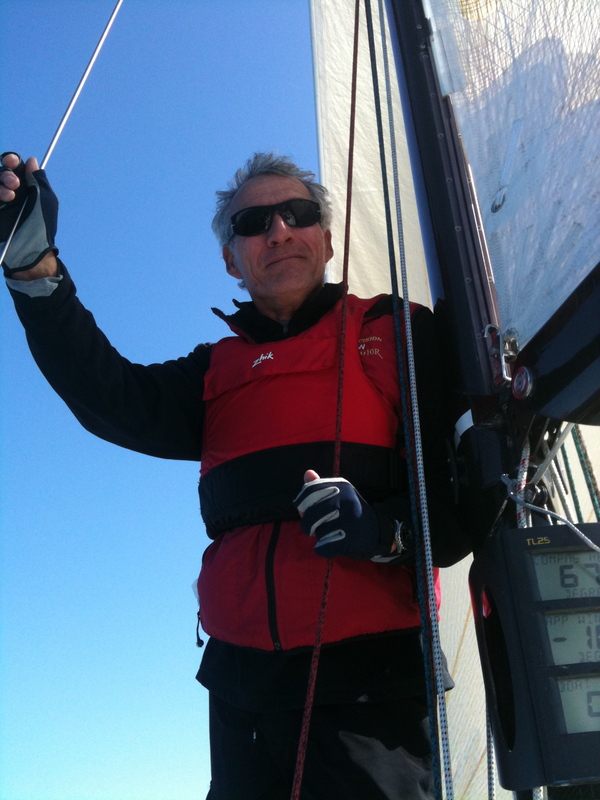 Claude, master of the foredeck. 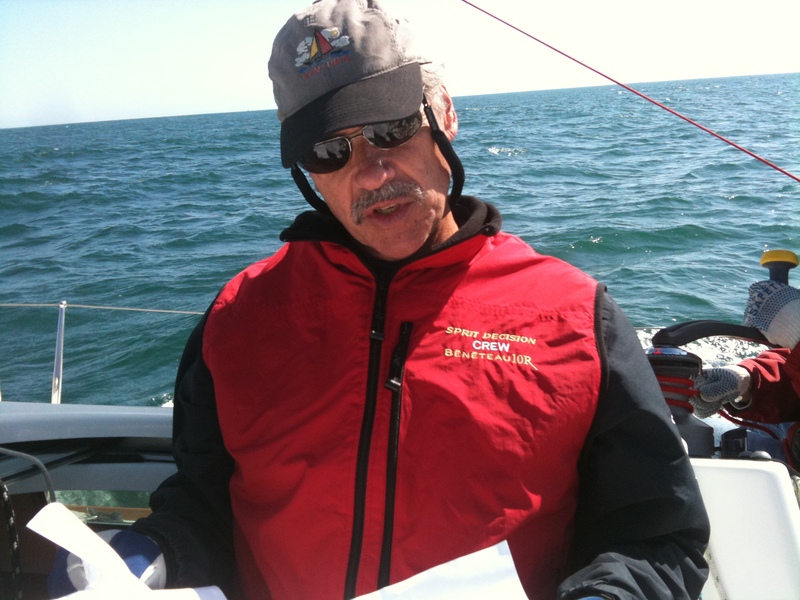 Captain Tom consults the race rules. "Now, which platform is the mark? Gail or Gilda?" 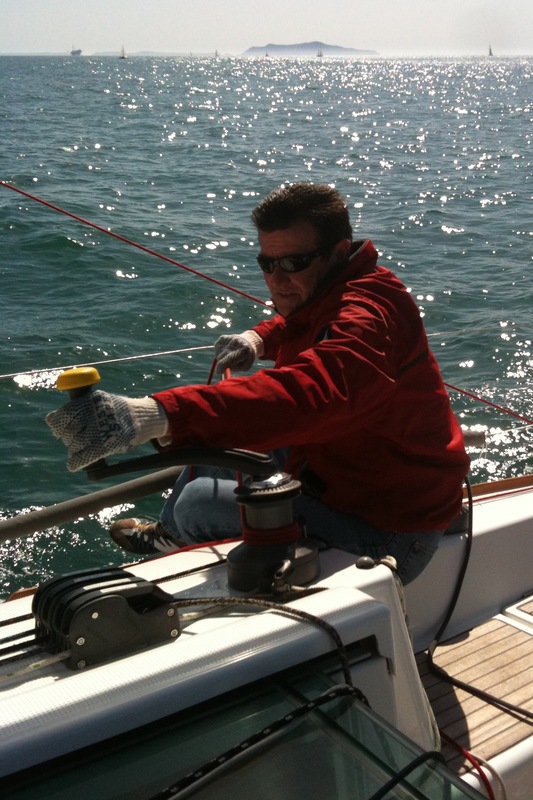 Darroch at the ready on the foredeck. "So, George! Do you want us to fly the spinnaker now, or what?" The Matey on the rail, watching the wake go by. Captain George. Sailor. Leader. Legend. My problem was that, as I ran the spinnaker’s clue toward the stern, I was holding the working sheet on the wrong side of my body — so that when the wind filled the kite and the sheet pulled taught, I got caught between the sheet and the lifelines. Chicken winged, really. Luckily, I’d had my Wheaties and was able to extricate my foolish self. The boat I lived on 25 years ago was knocked down one early morning in Round Rock Passage in the British Virgin Islands after a hideous night sail with the charter guests from hell. We were moving the boat at night, something we all hated because no one on the three person crew got any sleep, and there was apt to be at least one passenger who could not sleep because they were seasick. 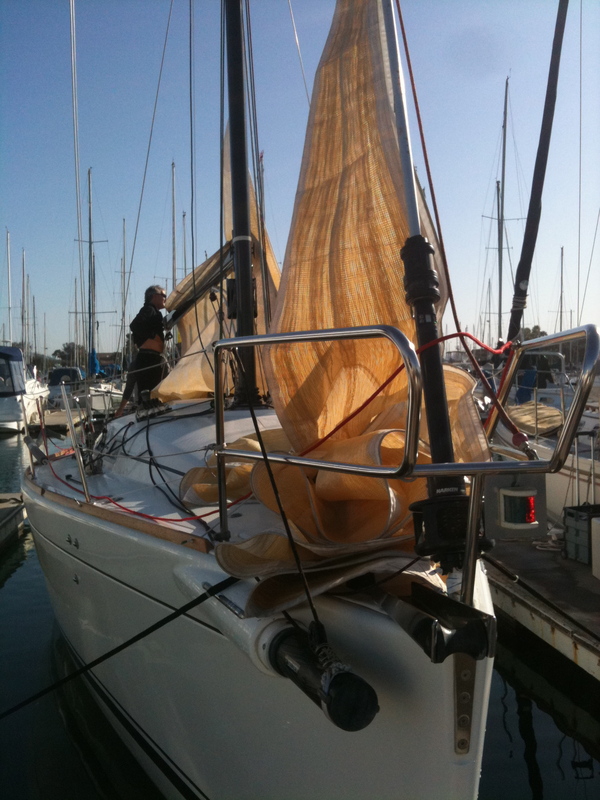 We were running as well; no spinnaker on this big old boat (75′ – sloop rig) but we had rigged a second sail with a whisker pole. We had rocked all night (like sailing a soap dish). The sun was coming up and I was below making muffins. Jim and Øle (mate and captain) saw the gust on the water and shouted to hang on. Fortunately I was on the leeward side of the galley as we went down. Jim let the sheet go so we did come back up, but not before losing three stanchions and potentially fracturing the rod rigging. 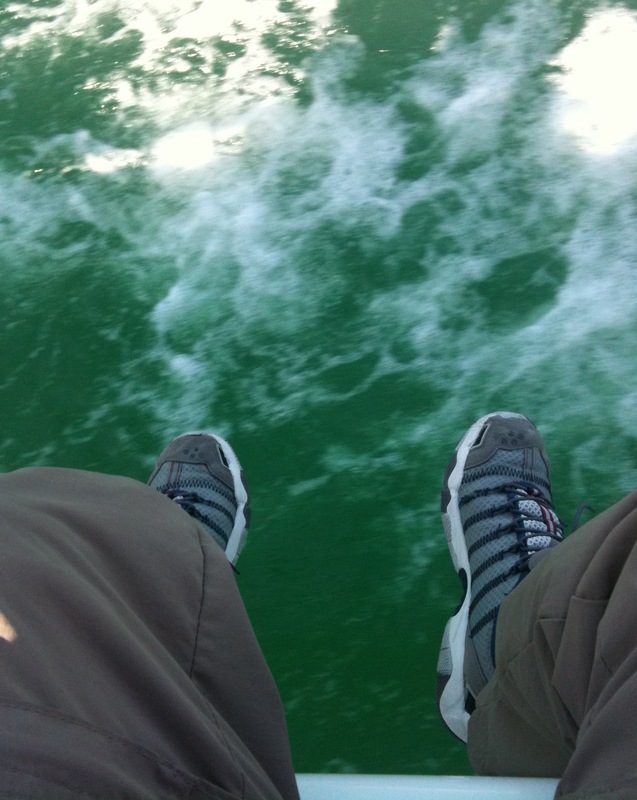 My responsibilities began at the companionway, and lots of small stuff had flown around below. Muffin. Batter. Everywhere. The owner’s wife had recently added framed watercolors to the main cabin and they didn’t survive (how tragic). No injuries, but a few shaken guests. I did manage to slice the crap out of my hand later in the day in a fit of exhausted stupidity. I’m glad that you had a great day on the water and that your adventure was just that, an adventure. As they say, “There is nothing – absolutely nothing – half so much worth doing as simply messing about in boats.” Here’s to a great sailing season. At 11 knots you were flying. That, Katie, is as fine an opening sentence to an adventure story as one could write. Captain George and I cruised the BVI with our families a few years ago. Where is Round Rock Passage? I crewed in a 16 ft (?) Sailfish with my wealthy friend Lee Richards on a glassy still lake when I was 11. We dipped Sweet Tarts into the fast moving water and ate them and he taught me the term “coming about”. Your story was so cool but I had to power hurl a couple of times in the middle and I just got my equilibrium back well enough to respond. I’ll probably be sticking to golf, where I know what’s going to hit me in the head. It’s never glassy and still in the Santa Barbara Channel — unless we desperately need wind during a pivotal leg of a race. Personally, I find golf much more dangerous. Not to me, of course — but to every person and every building within 180 degrees of where I’ve teed up to hit a drive. Got that right. There are still people hiding in adobe clad condos in Puerto Vallerta since 2007, waiting to see if I will tee up another mulligan and shell them like Sgt Rock with a borrowed mortar. Though that course did feature live crocodiles, something the Santa Barbara waters cannot boast (I hope). A few years back I did once man an oar on a whaling type boat in a race (me, 3 others and a coxswain) across the Hudson River and back in a feat that sort of resembled yours (the going around something and coming back part) as part of “Floating the Apple”-all good nautical fun spread amidst some pros and many novices-minus the life.threatening circs…unless you count possibility of falling into the Hudson, or having someone land a plane on top of you. So it’s not like I don’t get the water race thing. I just would probably veer to the Jimmy Buffett portion of sailing if I had half a chance. Great distillation, Paul, of our recent adventures on the high seas and our jubilant return to the watery realm. A note of interest on the outrigger canoes we saw. One of them looked a little like the Chumash “tomol” canoes you mentioned. My understanding was that these sea-going canoes were unique to native America, made possible by the natural oil seep at Coal Oil Point near Isla Vista. 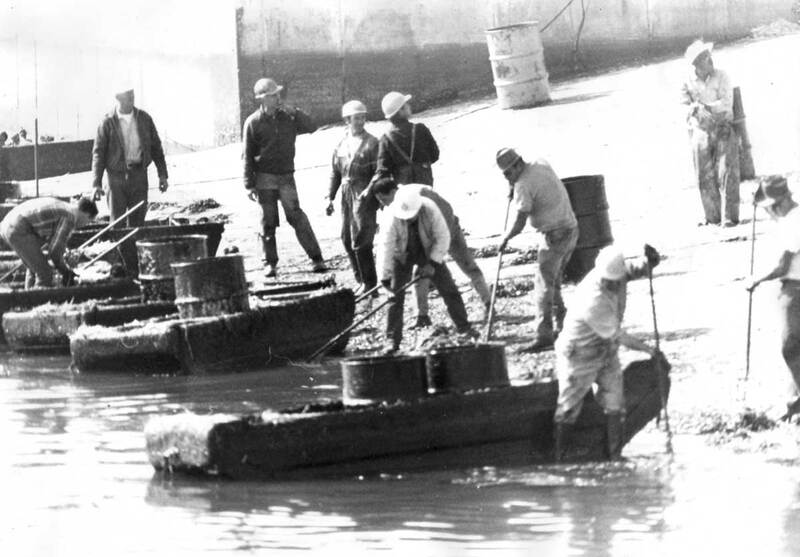 The tar was used to keep them water-tight — the same tar, no doubt, that attracted 76 Union and other oil companies to drill for oil in the Channel in 1958 and into the early ’60s. The Santa Barbara Museum of Natural History website says the canoes were make of redwood or driftwood planks tied together with hemp and coated with ‘yop,’ which was pine tar and hardened asphalt. (This knowledge was passed down by a single witness, the remarkable Chumash elder Fernando Librado, to the iconoclastic anthropologist John P. Harrington — both very interesting characters.) However, I doubt the canoes were nearly as fast as our venerable Sprit Decision with her new smooth hull. Hardalee! According to many sources, the Coal Oil Point seep is the world’s largest natural oil seepage.